Added moon distance in miles. The issue "The view of a location is not correct on the map!" is answered below, see the FAQ! 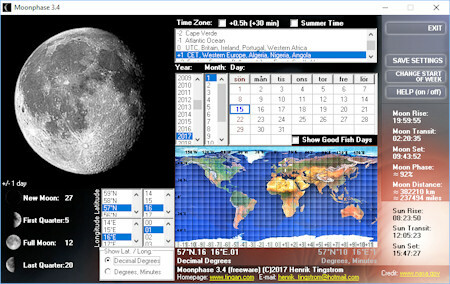 Displays the current moon phase of current day as an icon in the Activity field. You can change time zone, latitude and longitude (you can also click on the map!) 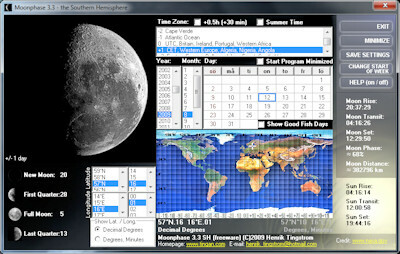 to get a more accurate moon distance, moon rise, moon transit and moon set times and also the sun rise, sun transit and sun set. A little bonus: If you like to fish, mark the 'Show good fish days' option (fishing calendar, derived from 'the anglers Almanac'). Question: The view of a location is not correct on the map! 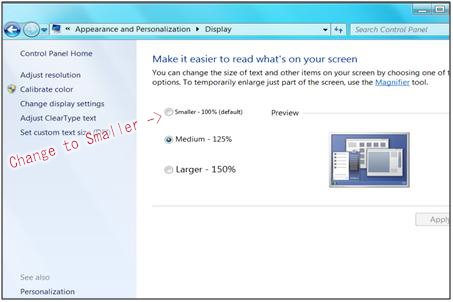 Answer: The option (Win7), Control Panel/Apperance and Perzonalization/Display/"Make it easier to read what's on your screen" is changed to "Medium" or "Larger". Default is "Smaller". If bitmaps (pictures) also be resized, they would look blurred. The map is a bitmap. Change the option to "Smaller". Answer: Known date format when the error might occur: 'Thai'. Change the regional settings to British date format.